Product prices and availability are accurate as of 2019-04-18 04:47:34 UTC and are subject to change. Any price and availability information displayed on http://www.amazon.com/ at the time of purchase will apply to the purchase of this product. Use this cord for tassels, wrapping rings, micro-macrame and/or threading those beads whose holes were too small for the other cord. You can also use it to make a really small, delicate Chinese knot or use it to accent other knots. Chinese Knotting cord is a round, braided cord made from nylon. 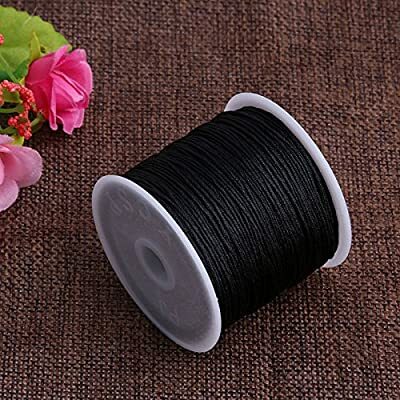 It is a flexible cord, with enough stiffness and durability to withstand the pushing and pulling of chinese knotting (or any other kind of knotting). It has a beautiful grip to it that holds the knots tightly. Great for creating your favorite jewelry pieces, such as Bracelets and Necklaces, fulfill your great idea of unique jewelry. All the size are measured by hand ,so please allow1-2cm differ.